I had my 4th AD referral for the year this weekend for AmEx Platinum. This means 7,500 points for me and 40,000 points for them (after $3k spend). For those who use my links, thank you!, and for those who don’t but got the idea from me or my blog, you are robbing me (or any AmEx member really) of points, and should feel really ashamed that you just threw out $75 (at least) to whomever could of sent you a referral. So if you get the inkling to go platinum, hit me up, I’ll buy you dinner! The reason for the generosity is because AmEx points are valuable to get off Okitraz for nearly free! 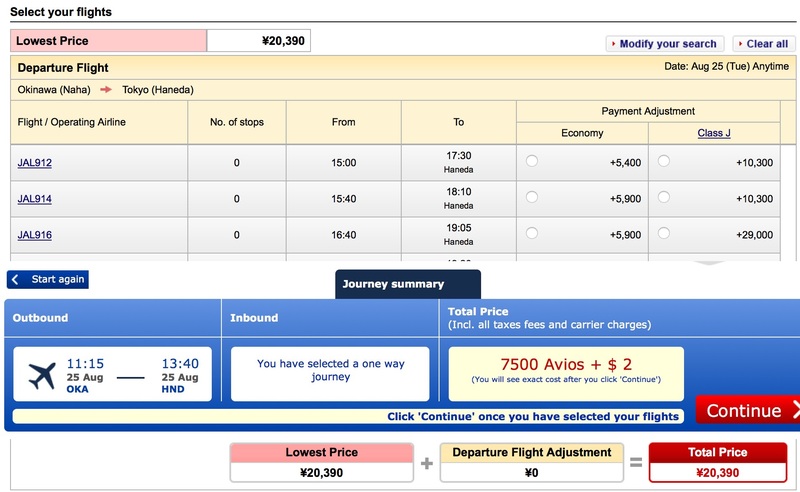 The trick is to use British Airways Avios Miles to book on Japan airlines. Instead of getting one cent per point, booking an economy fare from Haneda to Ho Chi in city will give you 13x the value per point than cash back. Nominally even a flight from Okinawa Naha to Tokyo Haneda will give you twice the value than cash back. So your sign on bonus will get you $800 in travel at least. You can see that Avios miles are very valuable from their hub in Haneda. You can use the awards booking calculator to search other destinations. There are other ways to get to Haneda including SkyMark and ANA experience Japan Fare. Lastly you can use AmEx points on ANA which I have yet to look into. Please if you want AmEx Platinum, please hit me up and I can send you a referral, they are now sending it direct to FPO/APO via USPS as confirmed by a O-6 select (after some grilling by another O-5). This entry was posted in Burn (spend), Japan and tagged Avios, ONEWORLD.